A devoted father spins fanciful yarns to inform and to delight. I've recently struggled to get through a book that, as Mark Twain remarked, "Once you put it down, you can't pick it back up." When I first discovered this volume, its title seemed so promising: American Jewish Fiction: A Century of Stories, edited by Gerald Shapiro. It's an anthology of stories written by mostly irreligious Jewish writers over most of the twentieth century. "Irreligious" is an understatement; most of the works featured in this volume were produced by authors who were ambivalent, at best, regarding their very identities. At worst, many of these writers come across as downright hostile to the heritage of the very Jewish people whom they claim as their kin. Their Jewish identity was informed by two factors: the immigrant experience and the struggle to overcome anti-Semitism. After a generation or two, the immigrant experience had faded to a distant memory and the United States of America had become a far more tolerant society than our great-grandparents ever could have imagined. Today, the overwhelmingly majority of Jews in the United States are completely assimilated, with no connection to Judaism whatsoever. Thus, the tales in Shapiro's volume contain very little authentically Jewish content. Most of them deal with disaffected Jews struggling to make it in American gentile society while plagued with feelings of guilt over their indulgence in the prevailing cultural hedonism and their abandonment of their parents' (or grandparents') traditions. Only the stories written near the turn of the century, by authors such as Abraham Cahan, even attempt to depict Jewish tradition with any fealty, and those works are populated with timid, uninspiring characters. Basically, this collection of tales paints a picture of modern Jewish life as a decrepit shell of what it once was. The otherwise gifted thinkers represented in this volume, including such literary heavyweights as Saul Bellow and Philip Roth, have predicted, and even expected, the demise of traditional Judaism in America. In their cynical view, religious Judaism is a thing of the past. After all, bagels and brisket alone, no matter how tasty, can neither inspire nor inform a coming generation. Now for the good news. There is another reality, a trend that the secularist, tradition-loathing old guard can no longer ignore. The Jewish People are in the midst of a spiritual, artistic and literary renaissance the likes of which have not been seen since Antiochus bit the proverbial dust at the hands of a small band of upstart Temple priests (look it up). Quietly, gradually, and tirelessly, an irrepressible minority within American Jewry has embarked on a genuine return to traditional education and observance; the Jewish landscape has undergone a sweeping transformation over the past half-century. Visionary rabbis and community leaders, often with meager funding and little communal support, have dedicated themselves to reviving on new soil the intellectual and spiritual life that was usurped from us in Europe. A fresh, vibrant, informed, authentic Judaism now confidently asserts itself. It is a brazen repudiation of the insecure, assimilationist mentality that prompted so many to toss their tefillin into the Hudson River on the way from Eastern Europe a century ago. This revival of traditional Jewish life has produced refreshing by-product: an innovative and engaging crop of literary works for adults and children alike. The latest wave of Jewish writers either express a confident identity and a positive commitment to traditional life or acknowledge that such committed Jews exist. These writers develop characters who are comfortable among their fellow Jews, who live secure, family-centered Jewish lives, and who are fully capable of confronting - and overcoming - the same types of struggles that non-Jewish writers have portrayed for centuries. Mirka Hirschberg is one such character. 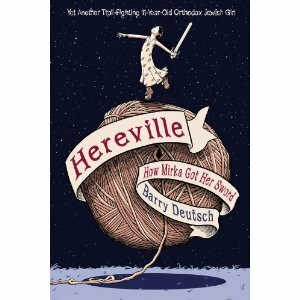 She is the eleven-year-old protagonist of Barry Deutsch's graphic novel, Hereville: How Mirka Got Her Sword. A nonconformist, Mirka dreads her stepmother's lessons in "womanly arts." She dreams of a life of adventure, and would rather go out and slay some dragons than sit in the house learning to knit some boring old sweater. Four of her eight siblings are pictured in the story: Mirka's fourteen-year-old sister, Gittel, her eight-year-old brother, Zindel, and her ten-year-old stepsister, Rachel (pronounced "ROCH-el," the "ch" representing a sound not included in the English language). Mirka is the maverick of the bunch, daring and witty, but a bit clumsy. Early in the story, she demonstrates her bravery by rescuing Zindel from a pair of older bullies. Yet, she also has a knack for getting herself into trouble, often venturing alone into the woods and being forced to confront various adversaries. Life gets interesting when nobody believes Mirka's stories about her homework being eaten by a talking pig that torments her daily in the woods or her other outlandish tales. In fact, Gittel worries that Mirka's overactive imagination will tarnish the Hirschberg family as a bunch of crazies, ruining all of their future marriage prospects. When Mirka decides to take matters into her own hands by defeating the pig once and for all, she gets herself into even more trouble than she had ever thought possible. Hereville is the name of the Hirschbergs' insular hometown, a fictional community apparently inspired by the real-life all- or mostly-Jewish suburban towns in upstate New York. In these towns, including Monsey, New Square, Kiryas Yoel, and others, a fervently Orthodox lifestyle is the default, accepted way of life. Traditional Jews do not live brainwashed, primitive, ritualistic lives by rote, as portrayed in the execrable Fiddler on the Roof; rather, the Jewish lifestyle is informed by a vast and profound tradition of Torah scholarship, itself characterized by sharp critical thinking and inquiry. Deutsch does a reasonably good job depicting a way of life in which modestly dressed boys and girls attend separate classes and do not socialize with each other, the Jewish Sabbath is respected and observed by entire community, everyday speech is peppered with Yiddish expressions, and large families of six, seven, or even ten children are the norm. The story does, however, contain a few inaccuracies. For example, Shabbos (the Jewish Sabbath) begins eighteen minutes before sundown on Friday afternoon, not after the emergence of three stars; by the time the stars are visible, kindling a flame is forbidden by Jewish law. The day ends on Saturday night, about one hour after sunset; it does not last from sunset to sunset. Also, it's unlikely that a Yiddish-speaking community would adopt the modern Hebrew expression "Shavua tov" ("Good week") as a greeting at the end of the Shabbos day. A further drawback is that it's not completely clear whether Deutsch strove for a complimentary or a mocking portrayal of traditional Jews. On the one hand, the characters are well-developed, healthy people, rather than the appalling one-dimensional stereotypes that often pass for Jews in the mainstream media. Mirka, despite her rebelliousness, lives with a deep and abiding respect for Jewish law and the mitzvos (Divine commandments). Gittel's concerns regarding Mirka's strange behavior are real and valid. The sense of community and family togetherness that characterizes the traditional Jewish community is conveyed in a very appealing manner. Yet, some of the book's depictions come across as a bit silly. For example, are Orthodox Jews really so dumb as to leave every lamp in the home on for the entire Shabbos day? Some of us have heard of, and use, timers to turn lights on and off automatically. In many cases, a four-watt night light will do. More distressing was the description of Mirka's stepmother, Fruma, in the book's opening scene: she's an overbearing, argumentative woman with a disproportionately long nose. That characterization almost made me vomit. It was reminiscent of the tired, stupid anti-Semitic (and self-hating Jewish) stereotype of the prototypical, unkempt, unsavory, hook-nosed Jew, hunched over, with bulging pockets, bad breath, and no redeeming qualities whatsoever. (Think of the Penguin from "Batman Returns.") Thankfully, Deutsch manages to save this novel from that particular abyss by showing Mirka and her siblings as attractive, soulful characters with real aspirations and refined characters. Gittel warns Mirka that nabbing even one grape from a stranger's garden would constitute stealing and would therefore be a grave sin; this conversation refutes the vile anti-Semitic image of Jews as money-grubbing thieves. Mirka has a fun personality, and proves to be a delightful character. Like Yaakov Peretz facing a band of swarthy thieves with only his wits to protect him, Mirka musters all of her resources to overcome a whole slew of adversaries, natural and supernatural. How Mirka Got Her Sword appears to be the first in a series on the Hirschberg family and their cozy hometown. There's a lot of potential here; several of Mirka's siblings go unnamed throughout the story, and this novel's resolution leaves the tale far from over. Hereville is sure to entertain readers for years to come. Welcome to Wyckoff Works of Wonder! Here, you'll find perspectives on children's storytelling, childhood, parenthood, and related topics, as well as updates on my works in progress. Through my writing, I hope to unlock children's imaginations, to expose them to new and wonderful possibilities, and to inspire them to reach for new heights in their development as morally responsible human beings. My first novel, Yaakov the Pirate Hunter, is now available in both paperback and electronic forms. 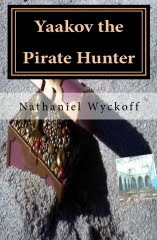 "What we have here in Yaakov the Pirate Hunter is a Mid-Grade Jewish science fiction adventure with pirates and robots. And it is awesome." I'm a traditionally observant Jew, a devoted father of six, and an independent author of children's literature. Telling and writing stories are two of my favorite activities. The idea for my first novel was sparked by my third child's request for a story about robots, and my daughter was the inspiration behind my forthcoming second novel.